GST portal goes live, software almost ready: GSTN Chairman Navin Kumar. A four-tier GST tax structure of 5, 12, 18 and 28 per cent, with lower rates for essential items and the highest for luxury and de-merits goods that would also attract an additional cess, was decided by the GST Council. Essential items including food, which presently constitute roughly half of the consumer inflation basket, will be taxed at zero rate. Nine-Member Constitution Bench of the Supreme Court upholds levy of Entry Tax. The Goods and Services Network (GSTN) has signed a Memorandum of Understanding (MoU) with Director General of Foreign Trade (DGFT) for sharing of foreign exchange realisation and Import Export code data, a move that is expected to strengthen processing of export transactions of taxpayers under GST, increase transparency and reduce human interface. SMS Alert Service launched for about 2.5 crore private and Government salaried employees in order to directly inform them about the deposit of tax deducted at the end of every quarter. Vehicle manufacturers required to give details of noise levels from April 1, 2017 in view of amendment to Form 22 under the Central Motor Vehicles Act, 1989. Indira Gandhi Prize for Peace, Disarmament and Development for 2015 to be awarded to Office of United Nations High Commissioner for Refugees. Foreign Exchange Management (Manner of receipt and payment) Regulations, 2016. Withdrawal of Legal Tender Character of existing ₹ 500/- and ₹ 1000/- Notes. FAQs on Withdrawal of Legal Tender Status of the existing Bank Notes in the denominations of ₹ 500/- and ₹ 1000/-. 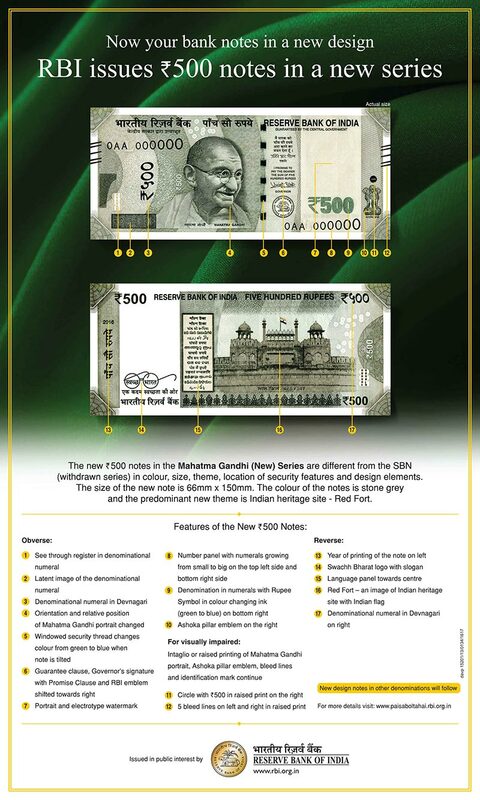 RBI issues ₹ 500 notes in new series. 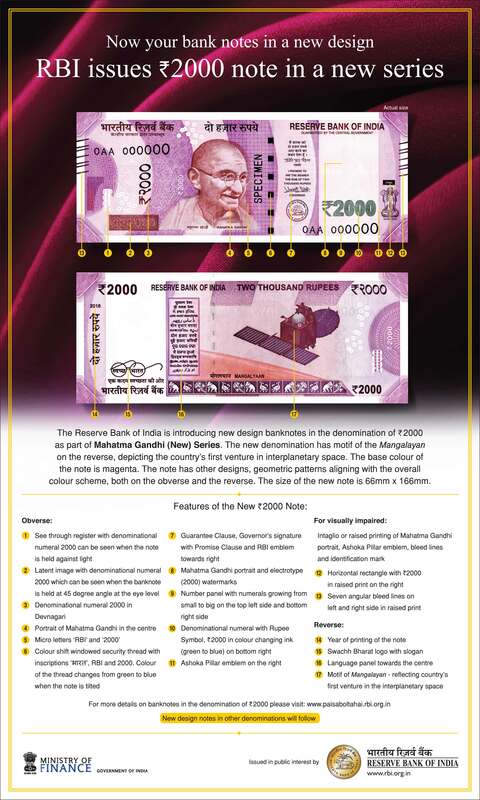 RBI issues ₹ 2000 note in new series. Inland Container Depots located at Kalinganagar and Tumb Village (Taluka Umbergaon, District Valsad) are included under Para 4.37(a) of Hand Book of Procedures (2015-2020) for availing export promotion benefits under Chapter 4 of Foreign Trade Policy. The wordings HMS-I & HMS-II as appearing in Public Notice No. 38/(2015-2020) dated 6th October, 2016 are replaced by un-shredded Metallic Waste and Scrap. Various amendments have been carried out in the Standard Input Output Norms(SION) of product group: Food products. Import of Boric Acid is subject to ‘Actual User’ condition. Therefore Boric Acid is made ineligible for imports under Duty Free Import Authorisation (DFIA) Scheme. Provisional anti-dumping duty imposed on 'Wire Rod of Alloy or Non-Alloy Steel' originating in or exported from China PR. Anti-dumping duty imposed at modified rates on 4, 4 Diamino Stilbene 2, 2 Disulphonic Acid (DASDA) originating in or exported from Peoples Republic of China up to and inclusive of 22nd January, 2019. Withdrawal of exemption from service tax on cross border B2C OIDAR services provided online/electronically from a non-taxable territory to consumers in taxable territory in India. Combined Annual Return Form for Central Excise and Service Tax. Rebate of State levies on Export of Garments-Implementation by CBEC. Procedure regarding clearance of import of metal scrap. Transferability of goods imported/procured by debiting duty in SFIS scrips. Changes in AIRs of Drawback effective from 15.11.2016. Rebate of State Levies on Export of Garments- revised rates regarding. Procedures for handling exporters obligatons under EPCG authorizations rationaliized. Rate of exchange of conversion of the foreign currency with effect from 21st October, 2016. Exemption notification for the goods imported by Ford Foundation rescinded. All Industry Rates (AIRs) Drawback effective from 15.11.2016. Customs, Central Excise Duties and Service Tax Drawback Rules amended. Deferred Payment of Import Duty Rules, 2016. Deferred Payment of Import Duty Rules, 2016 (Specifying class of Importers to make deferred payment of duty). Notification No. 25/2012-ST dated 20th June , 2016 amended. Notification No. 30/2012- ST, dated the 20th June, 2016 amended. Entry Tax: Asserting that State Governments are well-within their rights to design their fiscal legislation, the Supreme Court has upheld the Constitutional validity of entry tax levied by various states on goods entering their territories. By a majority verdict of 7:2, a Constitution Bench headed by Chief Justice of India declared that a non-discriminatory tax does not per se constitute a restriction on the right to free trade, commerce guaranteed under Article 301 of the Constitution and entry tax, despite being a restriction of trade, could be validly levied - Jindal Stainless Steel Ltd V State of Haryana & Ors (SC). Whether when an order rectifying an original assessment order get merged with the original assessment order passed by the AO, then the appeal is maintainable against the said revised order on account of merger - M/s ELECTRO STEEL CASTINGS LTD V APPELLATE DEPUTY COMMISSIONER (CT) - 2016-TIOL-2786-HC-MAD. Amendment having effect of restricting rebate to extent relatable taxable goods produced in manufacture cannot be brought with retrospective effect by way of explanation - Jindal Agro oils Balwada & Ors V State of Madhya Pradesh & Anr - 2016 95 VST 260 (MP). When Foreign Trade Policy grants substantive right of reimbursement of CST to EOUs on interstate purchases from other EOUs , same cannot be curbed on ground that procedure prescribed does not approve of such clearance - Hospira Health Care India Pvt Ltd V Dev. Commr - 2016 340 ELT 668 Mad. State Government challenging levy of service tax by Union Government on certain service activity through adjudication cannot avail alternate remedy of civil suit as well as Doctrine of Election would apply in favour of case contested in adjudication - State of Rajastan V UOI - 2016-TIOL-171-SC-ST. When voluntary disclosure scheme is floated, prescribing conditions, no further leniency can be shown by Court interfering with compliance of conditions - Manpreet Engineering and construction company V UOI - 2016-TIOL-124-SC-ST. In absence of any provision under Excise law to recover drawback on non receipt of export proceeds, Rule 16A of Drawback rules cannot be applied retrospectively for recovery - Surinder Singh V UOI - 2016 340 ELT 97 S.C.
Assessee after having opted for settlement to settlement commission cannot be permitted to dissect order of such settlement commission with a view to accept what is favourable and reject what is not - Hi Design V CCE - 2016-TIOL-2532-HC-MAD-CX. Credit can be availed on basis of Advise of Transfer issued by Head office for transferring excise duty paid on inputs and capital goods - CCE V Bharat Sanchar Nigam LTd 2016-TIOL-2597-HC-RAJ-CX. In the guise of ROM, the entire complexion of order cannot be changed by enhancing penalty imposed in earlier order and levying interest not ordered earlier – CCE&C, Calicut V Capt. K.P. Dinakaran - 2016 (44) STR 374 (Ker). It is not open to any adjudicating authority to straightaway rely on the statement recorded during investigation/inquiry before the gazetted Central Excise officer, unless and until he can legitimately invoke clause (a) of Section 9D(1) – M/s G-Tech Industries V UOI & Anr. -2016 TIOL 2749 HC P&H CX. Cenvat credit on Capital goods received in a given financial year cannot be denied because at the time of the receipt the appellant was also engaged in the manufacture of final product attracting nil duty ignoring the fact that the appellant was also engaged in the manufacture of dutiable final product which were exempt from duty in terms of value -based exemption notification – Kaleesuwari Refinery Pvt. Ltd, V CESTAT, Chennai – 2016 340 E.L.T. 632 MAD. Rebate not deniable only for not submitting BRC as said document not specified as mandatory document under Para 8.3 of C.B.E.&C Excise Manual of Supplementary Instructions for claiming rebate of duty paid on export goods. –Jubilant Life Sciences Ltd V UOI – 2016 341 E.L.T. 44 ALL. Claim for benefit of exemption notification is a legal ground and can be raised for the first time at appeal stage - Commissioner of Service Tax Ahmedabad V Bacha Finlease -2016 44 S.T.R. 590 GUJ. DEPB was found to be genuine document, though obtained by seller by producing some forged documents, to which purchaser was not party. Hence duty could nt be demanded from importer – Pee Jay International V Commissioner of Customs - 2016 340 E.L.T. 625 P&H.